Thank heavens for grandchildren. If we didn't have them, there wouldn't be many designers bothering about how new technologies can be applied to the needs of seniors. 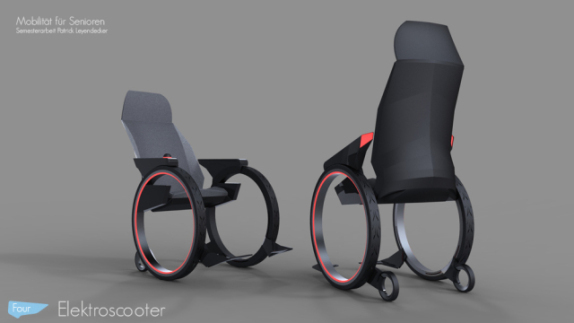 Patrick Leyendecker is just one of the many young designers who are trying to moderate the pain and stress that comes with aging and having to adjust one's ways to so many of life's daily needs. 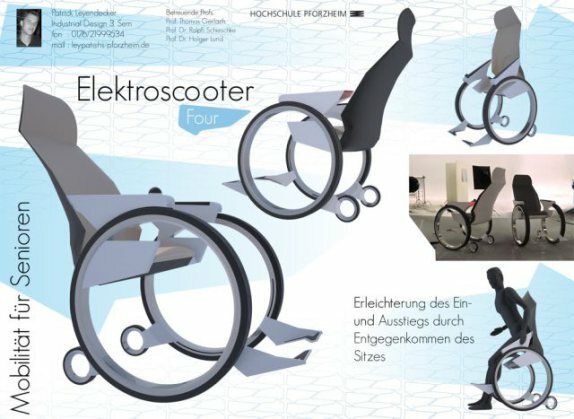 Leyendecker, a fourth semester design student at University of Pforzheim in Germany, eases at least two of those needs with his Elektroscooter: sitting down and getting up. What accompanies those movements for a senior is, very often, back pain. So Leyendecker put his talents to work and came up with a very sensible solution: bring the chair to the person and let the chair 'carry' the person down to the seated position - thereby leaving the senior's back strain and pain in the last decade. As the foot rests and little rear tires of this scooter are adjustable and are connected to the main wheels of the scooter, by shifting the position of these features, the main wheel guides the seat position forward. Then, by rotating a ball on the arm of the chair, the chair's motors move the chair down to a seated position. A similar strategy lifts the person to a semi-standing position.